On Friday, November 18th, the FCC released its long anticipated ICC/USF Report and Order and Further Notice of Proposed Rulemaking that was adopted October 27th. Under Phase I of the Mobility Fund adopted by the FCC, wireless ETCs will be eligible for a one-time shot of $300 million as part of the Mobility Fund. Mobile carriers serving tribal areas will be eligible for an additional $50 million in support. In addition to the one shot Mobility Fund, the FCC will develop a targeted, Phase II mobile fund that will provide up to $500 million per year in support for wireless carriers. Current "portable" support will be phased down over five years for all carriers, including carriers in "Covered Locations" currently not subject to the cap. Mobile carriers that receive high-cost support will have roaming and collocation obligations imposed on them. Rules for Phase I support will form the basis for ongoing Phase II support that will be fleshed out as part of the FNPRM. "Time will tell whether Phase I and Phase II support amounts are sufficient to promote and sustain mobile voice and broadband networks in high-cost rural areas," stated Carri Bennet, RTG's General Counsel. "RTG will work with the FCC's Wireless Bureau to ensure that such limited support is efficiently targeted to genuine high-cost areas and is used to provision mobile voice and broadband services rather than to pad corporate bottom lines," promised Bennet. The Rural Telecommunications Group (RTG) will continue to digest the Order and FNPRM and analyze its impact on its members, and will hold a webcast on Monday, December 5th from 2:00 to 3:00 PM Eastern. In March 2014, the FCC adopted rules governing the use of 65 MHz of spectrum in the 1695-1710 MHz, 1755-1780 MHz, and 2155-2180 MHz (the Advanced Wireless Service or AWS-3) bands. The FCC’s Wireless Telecommunications Bureau recently released its AWS-3 auction rules and procedures. Designated Auction 97, the auction is scheduled to begin November 13, 2014. Short-form applications to participate in the auction are due by September 12, 2014(6:00 PM ET) and Upfront Payments are due no later than October 15, 2014 (6:00 PM ET). This webcast will provide an overview of AWS-3 Auction procedures, as well as incumbency issues and coordination requirements. The FCC’s recent USF order is setting the stage for wireless carriers that rely on support to provide mobile services. In particular, the FCC is proposing to streamline Phase II of the Mobility Fund to focus on (1) preserving existing mobile voice and broadband service that would not otherwise exist without governmental support and (2) expanding 4G LTE access to populations that will not have such service through commercial deployments. Until Mobility Phase II is actually implemented and operational, however, the FCC proposes to temporarily halt the continued phase-down of the old identical support at the 60% level, subject to a 1% wireless revenue threshold that for some could mean the instant elimination of USF support. 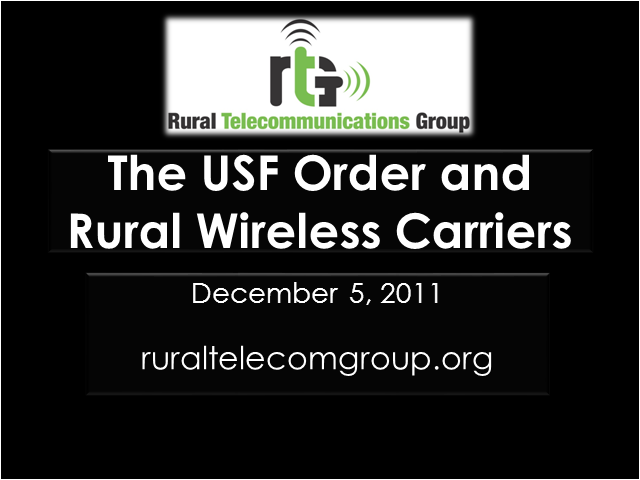 Join us for more details about the USF order and how it might impact your wireless ETC support. Join RWA on this webcast to review the FCC’s 600 MHz Broadcast Incentive Auction, which is scheduled for 2015. Background: On May 15, 2014, the FCC adopted the Incentive Auction Report and Order detailing the extremely complicated 600 MHz Broadcast Incentive Auction, which will make additional low-band spectrum available to meet consumers’ skyrocketing demand for mobile broadband services. The FCC’s Order addresses the 600 MHz band plan, geographic licensing areas, repacking procedures, opportunities for carriers to obtain reserve spectrum licenses and the Incentive Auction processes. This extremely complicated auction involves three interwoven parts: (1) a reverse auction that will recover spectrum from television broadcasters who voluntarily give up some or all of their spectrum rights in exchange for incentive payments; (2) repacking of those broadcasters that remain on the air after the auction has been completed; and (3) a forward auction through which the FCC will license the reclaimed 600 MHz spectrum to wireless providers. The Incentive Auction is considered wireless providers’ last opportunity to secure low-band spectrum licenses at auction for the foreseeable future. This webcast will address Incentive Auction processes, as well as post-auction and regulatory issues. Join RTG on this webcast to review the FCC's Public Notice and the procedures that will be used for the reverse auction (designated as Auction 901) scheduled to be held on September 27. Background: The FCC announced on May 2nd the competitive bidding procedures for Phase I of the Mobility Fund, the first-ever reverse auction for Universal Service support, to accelerate delivery of advanced mobile services that currently lack 3G or 4G service. Winning bidders must deploy either 3G service within two years or 4G service within three years of the award. The Mobility Fund will award up to $300M that was reserved out of savings from the Commission’s Universal Service Fund (USF) reforms. As part of last year’s reform, the FCC for the first time made universal mobile service an express universal service goal, and created the Mobility Fund to help close the nation’s gaps in mobile wireless service. The FCC currently allows access to Common Carrier microwave spectrum at nearly no cost. This pales in comparison to the cost of LMDS licenses that were distributed via auction. XO believes this policy not only lowers the value of these investments, but also creates inefficiencies in the microwave bands. XO is urging the federal government to modernize the microwave spectrum bands to make certain these assets are being properly valued as broadband is deployed throughout the country. XO will review its position on its efforts to ensure market forces are in play whether through an auction – similar to what LMDS license holders had to participate in to win licenses – or the application of fees that will dissuade warehousing of spectrum and increase the value of licensed spectrum. Widelity works with license holders to help them meet their substantial service requirements. Many license holders received extensions in 2008 and now must now make substantial service showings by June 1, 2012. Widelity will cover the options license holders have to meet the substantial service requirements by deploying services or constructing facilities that meet the FCC's “safe harbor provisions.” Widelity will also review equipment and deployment strategies. Lisa is responsible for all federal policy, regulatory, and legislative matters affecting XO’s interests before the FCC, Congress, and all levels of executive administration including regulatory and legislative strategy. Patrick has over 12 years of congressional experience; including time in the U.S. Senate and House and now corporate America. Mr. Lasky has over 25 years of business management and consulting experience in the technology and communications industries. Carriers across the globe are moving ahead with plans and early deployments for 4G mobile networks based on LTE. The availability and performance of LTE components is becoming a critical issue, especially in small, rural markets in the U.S. In this webcast we will take a look at the technology, challenges, and benefits expected from LTE and the migration from existing 2G and 3G networks. Also highlighted will be a base understanding of the consumer drivers and carrier approaches to satisfying the demand for increased capacity in ubiquitous mobile networks. Chris Ebert - Chris is responsible for strategic product marketing for LTE, WiMAX and 4G for Nokia Siemens Networks in North America. With more than 20 years of international experience in product marketing, product development and sales in the wireless industry, he has a proven track record in defining, marketing and bringing new technologies to market. Patti Dominach - Patti Dominach began her career in the telecommunications industry in 2000 when she joined Pario Solutions. During her tenure, Patti has held various positions that include Business Development, Marketing, and Sales. She is currently responsible for all marketing communications activities that include Pario’s Hosted Mobile Services, and the wireline & wireless products offered through Pario’s partners, Nokia Siemens and Juniper Networks. Carri Bennet - Carri has practiced telecommunications law throughout the post-divestiture period. Since 1987, she has represented primarily rural wireless carriers, telcos, cellular carriers, PCS providers, and CLECs before the FCC, state regulatory agencies, the courts and Congress. She is a nationally recognized expert on rural wireless issues and has been a key proponent for easing regulatory burdens that hinder small wireless companies. Join us on an important call to hear from industry groups on why AT&T's takeover of T-Mobile is bad news for competition and would hurt the wireless industry and the economy. We all know this takeover is not about spectrum. Decreased mobile competition means higher prices and less innovation. Data plans become more expensive while networks get slower. Join the fight to keep the mobile industry innovative and competitive. As the debate surrounding the proposed AT&T / T-Mobile merger continues to rage, small providers, public interest groups, consumer rights organizations, and antitrust experts have banded together to speak with one unified voice, calling for a block of the merger that surely represents a major step toward putting Ma-Bell back together. In anticipation of next Thursday’s House testimony, our panel of experts has prepared a unique, interactive webinar to serve as a background briefing on this pressing issue. Public Knowledge's Director of Government Affairs Ernesto Falcon, Sprint's Director of Government Affairs Trey Hanbury, Cellular South's Manager of Public Policy Ben Moncrief and RTG's General Counsel Carri Bennet. Public Knowledge is a Washington, D.C.-based public interest group working to defend citizens' rights in the emerging digital culture. The Rural Telecommunications Group (RTG) is a trade association representing rural wireless carriers who each serve less than 100,000 subscribers. Cellular South is the nation's largest privately held wireless provider with approximately 1,100 employees residing in the Southeastern United States. Sprint Nextel offers a comprehensive range of wireless and wireline communications services and served more than 49.9 million customers at the end of 2010. Webcasts for the rural wireless industry. Hear from leading wireless technology suppliers and manufacturers as well as rural wireless companies. RWA also provides regulatory and legislative updates on the rural wireless industry. RWA is the advocate for rural wireless carriers.